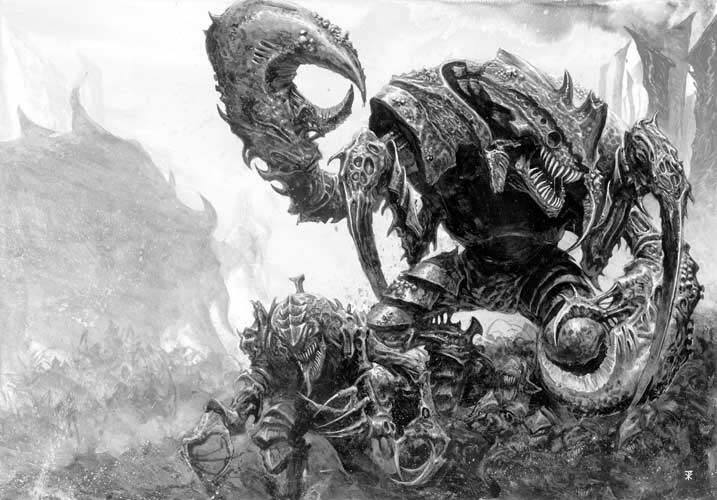 One of the very first big bugs to ever be produced by Games Workshop, The Carnifex has since become one of a number of Monstrous Creatures in the Tyranid range. To some of us though, it remains the original and best. 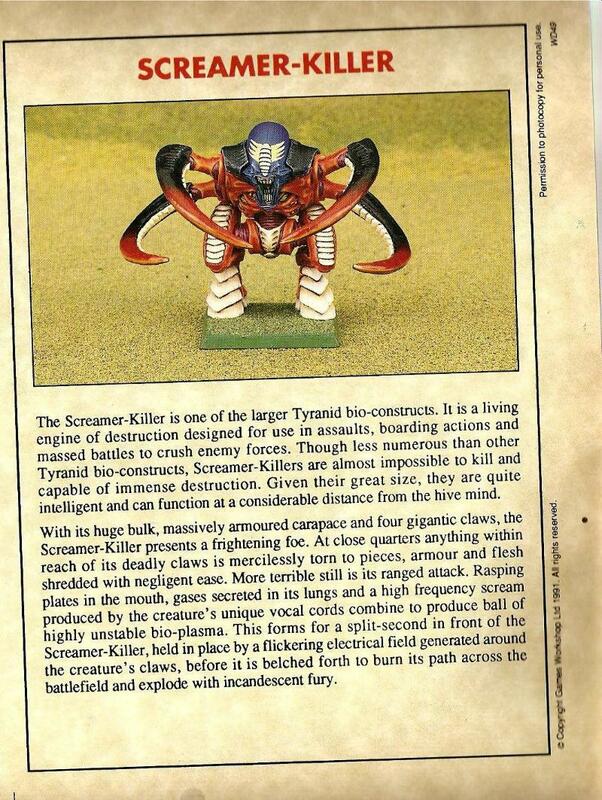 If you’re looking for a big bug on the GW webstore at the moment, you’ll find around 20 of them, but back in the early days of Second Edition, there was only one to choose from and that was the Carnifex, then called the Screamer-Killer. 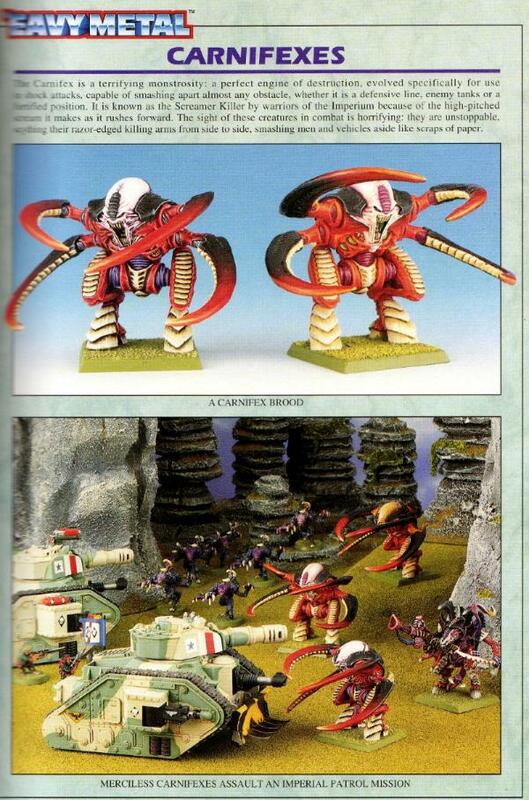 It was closely followed by a few others (the Hive Tyrant and Lictor among them) but it was the first big alien kit to see a lot of time on the tabletop (especially as it was almost impossible to kill) and it really pushed the boundaries of lead sculpting in the early 1990s. 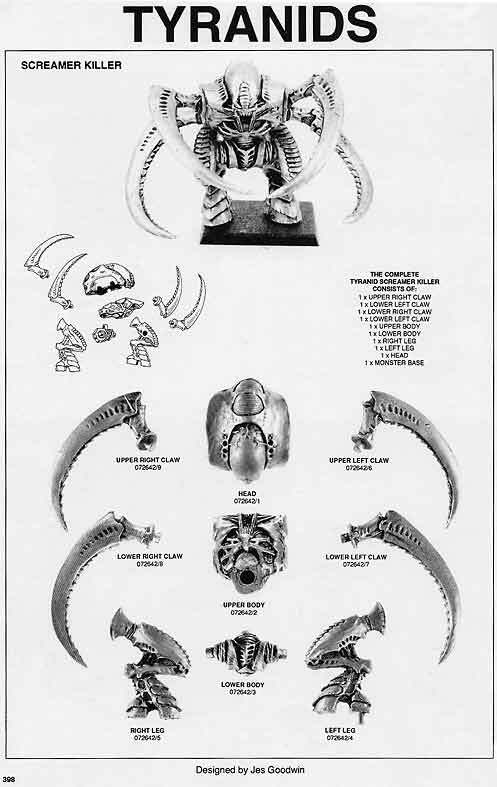 The original model was deigned by Jes Goodwin and back in 1991, it was known by its Ordo Xenos designation (something that happily is still around to this day), the Screamer-Killer. It was thus called because of its shooting attack (apparently deemed more relevant than its huge claws) in which it utilised chemicals to help it create a high-pitched scream that exploded the brains of its enemies at range. 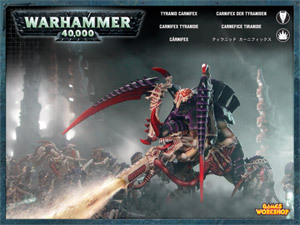 As the editions moved forward, the Genestealer cults and smaller Tyranid broods gave way to a fully fledged army during 3rd Edition (with the groundwork being laid by the Original Codex Tyranids at the tail end of 2nd Ed) and the Carnifex began to fit better into its role as a member of an invading army as it had always looked a little too big in a cult. The model got a new metal sculpt too, but it lost a little of the majesty it had had in its previous form, having to sacrifice this to bring the look of the Tyranid army units more into cohesion. In the years that followed, it would get another (and much improved) update in plastic, making the kit larger again and giving it an intimidating bulk that has since been perhaps a little eclipsed by other sizeable monsters. Forgeworld also pitched in with kits for the even tougher Stone Crusher Carnifex, while the GW kit has more options for weapons too. It’s not the unstoppable monster on the table top that it once was, but for those of us that remember the original, it still inspires fear whenever it raises its ugly head on the opposite side of the table, and it can still pack a real punch. 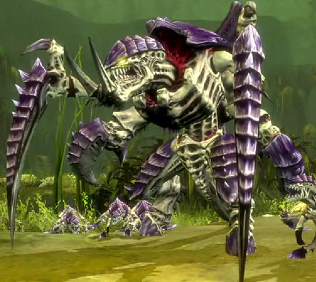 The Carnifex strain was constructed by the Hive Mind to be at the vanguard of the initial Tyranid assault. Its huge frame can not only provide cover for smaller aliens behind it, but its superior armour allows it to shrug off a lot of attacks. If and when it makes it into an assault, its claws can rip through flesh and armour alike with ease. So much firepower is directed towards these creatures in early assaults that the rest of the swarm can often reach its prey almost unencumbered. 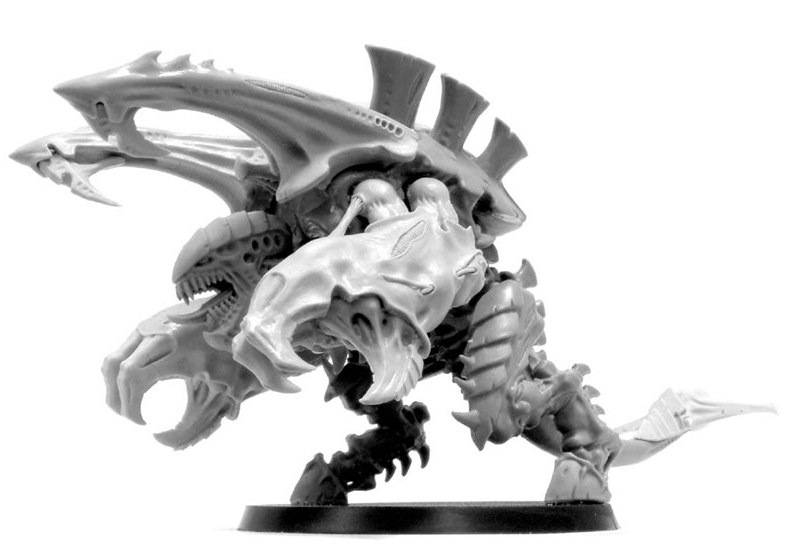 Standing over four metres tall and weighing in at around nine tonnes, this behemoth of an alien dominates battlefields and is often used in boarding actions when the Tyranid hive fleets encounter enemies in the vacuum of space. In the events preceding the Battle of Macragge (the first time these monsters were encountered by the Imperium), all attempts to engage the Tyranid bioships were thwarted, often with Carnifexes being deployed by spores or organic missiles into the heart of Imperial Navy and Space Marine ships. There is, among the ranks of Carnifexes, at least one with a unique personality and it is referred to as Old One Eye. It lost its eye (and initially its life) to a lucky plasma pistol shot. 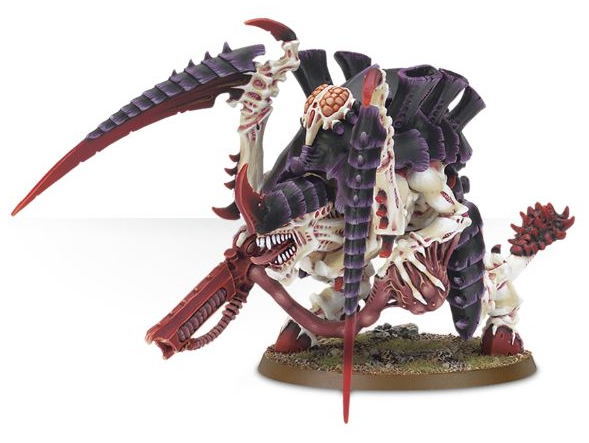 It developed the ability to heal wounds that might kill other Tyranid creatures and has gained some measure of independance having been long separated from the Hive Mind for an extended period. 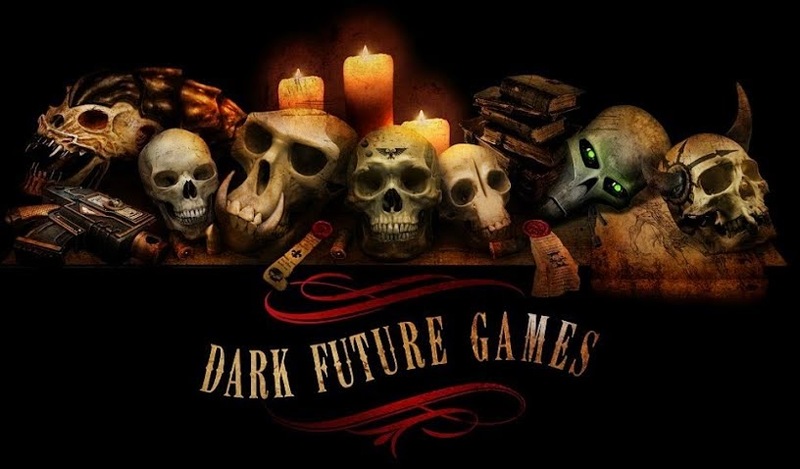 It is regarded as a great threat to humanity and the Inquisitors of the Ordo Xenos continue to hunt it to this day. 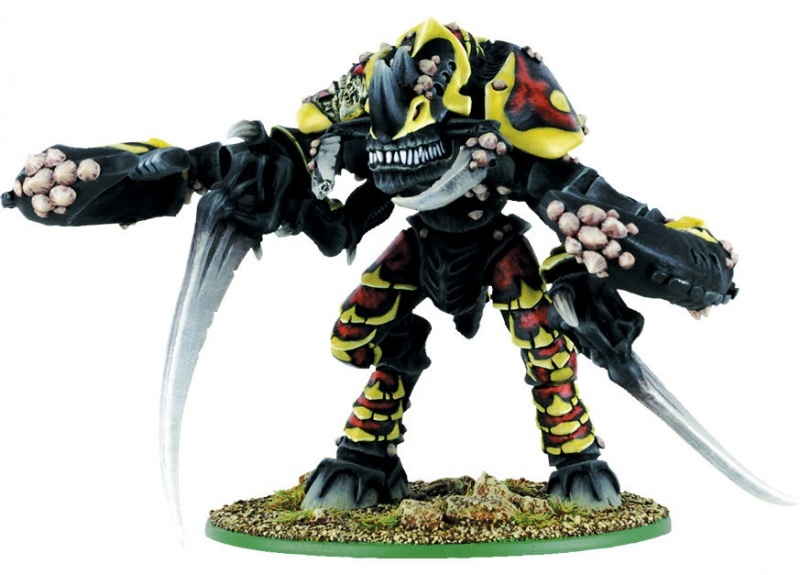 Carnifexes remain a very powerful unit that can really be the star performers of a Tyranid army. They’re hard as nails with a good toughness score and a great strength score, and they’re not that pricey when taken in their most basic form. But the star of many armies are the ‘dakkafexes’ which can use a pair of devourers to lay down a huge rate of high strength fire (and these are still not too pricey at all). The downside of these guns is that they have no AP number, but when you can pump out this many shots, you’ll be worrying all but the toughest armour. Terminators, Monstrous Creatures and Transports can be smashed to pieces by these things and if anything’s stupid enough to try and engage it in combat, it can still mess things up at close quarters too. Close Combat-orientated Carnifexes have a slightly tougher time. 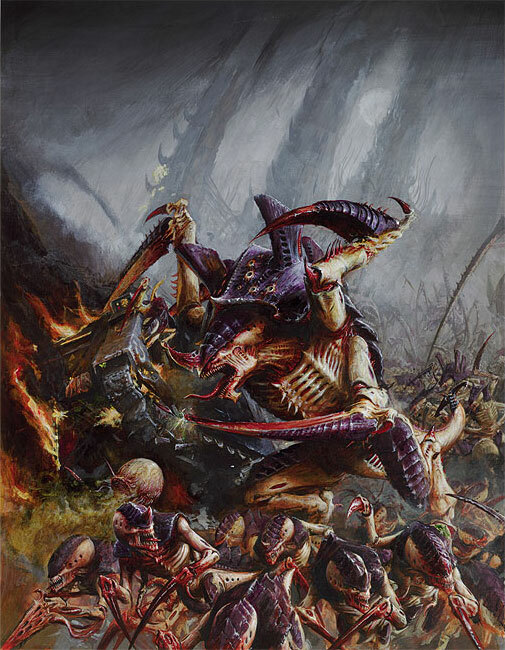 They will draw a huge amount of shots away from the rest of the Tyranid army, but with an only OK save, they might get brought down well before they make it into charge range. They make a great part of a second wave though, especially if you can tie up some of the stronger enemy shooting units with more disposable troops. For many, a ‘dakkafex’ or two is an ‘autoinclude’ in their lists and the clawed and taloned variety often get a good look in too. A lot of people point to the similarities between the look of Tyranids and the aliens from the film Alien that were inspired by the work of HR Giger. There are certainly elements in the Warriors that bear similarities, but the Carnifex holds a great deal more originality. The most you could say on that note is that they’re like aliens on steriods that have been bulking up and tacking on mass for a couple of years. They have always been huge and it’s only now, in the era of Imperial Knights, Forge World titans and Lords of War, that the Carnifex has started to look a little small. it always was the big monster of the army and it always should be. The original model was such a hit back in the day and was really terrifying both in terms of Jes Goodwin’s sculpt and also the rules it came with. I wasn’t so much of a fan of its next iteration as it looked a lot less threatening and a lot more awkward. Today’s Carnifex has thankfully reverted to its menacing, hulking former self and really is a testament to how plastics can bring life to models. You can see it shoulder barging a Rhino out of the way, the bolter rounds deflecting off its armour as it bears down on a squad of Space Marines. Travel back in time if you will to the latter days of 2nd Edition. I had two squads of guard and a lone Ogryn left on the tabletop and one of these things was heading in their direction. The lasguns were useless, the grenade launcher was doing nothing and the first thing it did when it got into combat was munch the only guy with a power weapon that I had. After that, I just had to watch it eat through all of my troops. Game over. That’s where I get my fear of these things from. That’s why, when I see one of these things in the opposing battle lines these days, I throw everything I’ve got at it. It might be one of the reasons I don’t do so well against ‘nids, but there are plenty of other reasons as well. Plenty. This lumbering giant from the hive fleet will always have a special place in my heart and in my gaming nightmares (which thankfully are rare). I still call it a Screamer-Killer to this day – Carnifex is a fine and very Tyranidy name, but Screamer-Killer is definitely scarier – and I still love that first model more than today’s but the latest model still looks great. And for all the Toxicrenes and Haruspexes and whatever else they get, this will be my No.1 big bug forever probably. Kudos to that terrifying monster. Do these bugs give you nightmares too? Are they your favourite mini? Comments below please! Brilliant article, really enjoyed it. 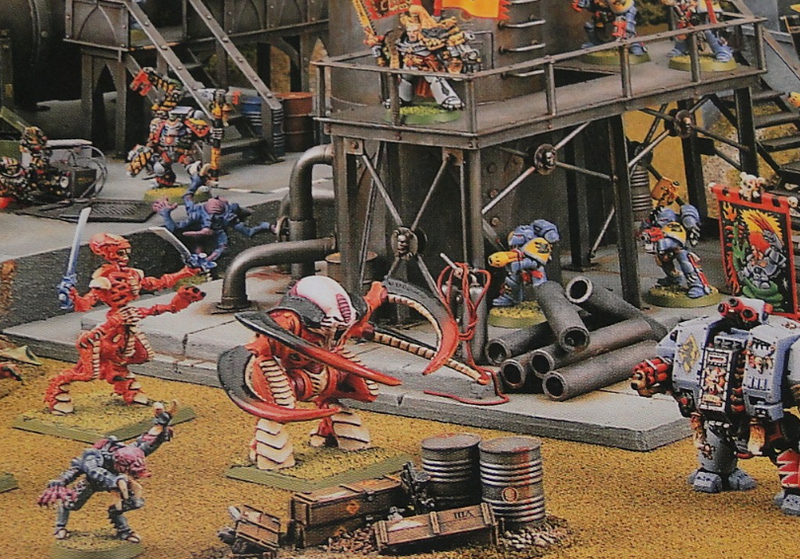 I remember well that pic of the Tyranids fighting the Space Wolves, from Games Workshop’s 40k introduction booklet that was free at the time, brings back memories! 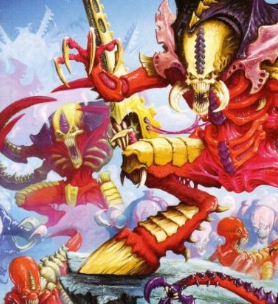 I think if I were to start a second army, Tyranids would be the one. I love the Carnifex model, and they have some really well detailed pieces in their range.